According to the monitoring report of the China Tongzhou Home Textiles Index, on February 2nd, the cotton milled cotton fabric closed at 147.08 points, down 0.53 points from the previous weekday's 147.61 points, and the index showed a slight decline. 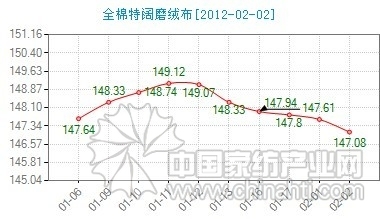 Just after the Spring Festival, the overall sales atmosphere of the market was weak, and the transaction price showed a steady trend. With the production of the post-holiday enterprises returning to normal, the home textile fabric market will also have a slight rebound.